We're a few weeks into the launch of NVIDIA's GeForce GTX 1070 - the little-brother to the performance-leading GTX 1080 - and partner designs with bespoke PCB's and cooling are just starting to appear. 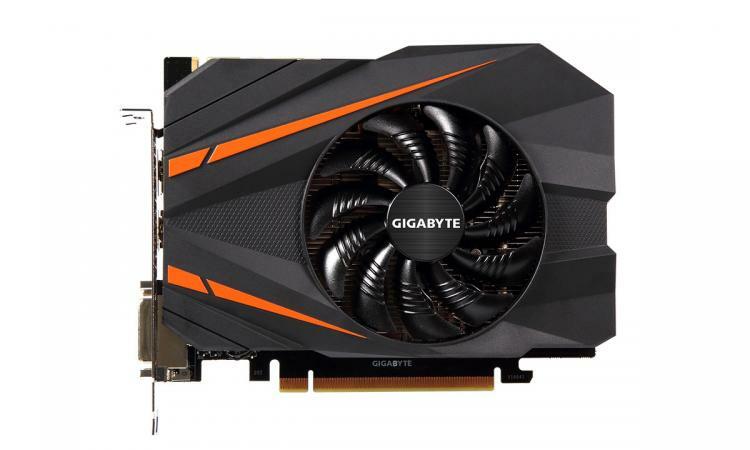 Primary among those will be models with extreme cooling solutions - dual or even triple-fan designs with hefty overclocks - but GIGABYTE are branching out into the small form factor arena with an additional model. The not exactly snappily named GV-N1070IXOC-8GD - or less formal 'GeForce® GTX 1070 Mini ITX OC' - boasts a dual-slot mini-ITX form factor design for systems with very cramped internals. Measuring just 169 x 131 x 37mm, it's over 110mm shorter than the Founder's Edition reference model and slightly thinner to boot. That's mainly due to a combination of a far shorter PCB and compact cooling relying on just one 90mm fan and three heatpipe heatsink. GIGABYTE have also added a little spice to the cooling thanks to a new fan blade pushing up to 23% more air than standard designs. They've also adopted a low-noise mode for the cooling, allowing the fan to cease spinning when the card is idle. Naturally, users will be able to create their own fan profiles to ensure that the card is as quiet as it needs to be, whatever the load conditions. Despite the abbreviated cooling this GTX 1070 is still equipped with a moderate overclock from 1683 MHz / 1506 MHz to 1721 MHz / 1531 MHz (BOOST/BASE) in the default 'Gaming Mode'. Brave souls can utilise an 'OC Mode' for the card, adding another 25MHz to both BASE and BOOST clocks. The card features a single 8-pin power connector, much like the Founder's Edition, allowing it some headroom above the standard 150W TDP for overclocking. In essence, this model shouldn't restrict gaming performance, far from it in fact. Display outputs for this card are comprehensive: two DVI-D, one HDMI 2.0 and one DisplayPort 1.4 connectors should be enough for most home setups including HTPCs. 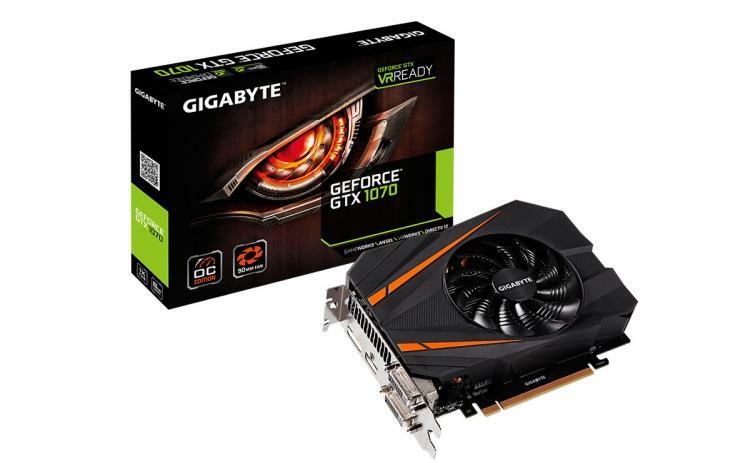 At present GIGABYTE are listing neither launch date nor pricing, the latter of which is eminently understandable given current market volatility.